I wasn’t certain whether I was going to like this movie. On the one hand, Alex Proyas directed Dark City, one of my all-time favourite movies… but on the other hand, he also did I, Robot. I shouldn’t have worried. 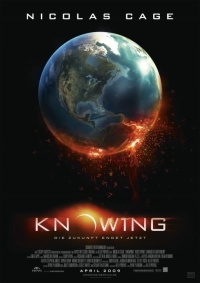 Knowing isn’t as good as Dark City, but it’s an interesting and well-done science fiction film. Its themes and ideas aren’t 100% original, but they’re thoughtful and well-executed, and in the end the film does dare to go to same places other films wouldn’t. The biggest flaw, to me, was the score by Marco Beltrami. Now, the guy’s written a couple of excellent scores (Hellboy comes to mind, and Max Payne was also quite good), and this score isn’t bad, either… but it doesn’t soar. And it needed to. I would’ve been crying my eyes out at the end of the movie, but the music didn’t manage to take me there. Another slight flaw is that the movie looks too… movie-ish. The lighting is beautiful, but not realistic. If this was a painting, it would look awesome, but with this movie’s plot it would’ve helped to ground things in reality a bit more. Every now and then the movie goes into shakycam mode, as if realizing that it needs to pull the viewer in more – but as with 99% of all cases, shakycam just alienates the viewer even more. Still, all in all it was a well-made, thoughtful film. Previous PostYou’ve got to know whom to bite.